Pearlescent Black, 1ST TO SEE WILL TAKE IT ITS GOT LOW MILLAGE AND VERY CLEAN INSIDE OUT ++ WARRANTED MILLAGE++ 2 KEYS ++ TONS OF EXTRAS ++ VERY WELL LOOKED AFTER ++ 3 MONTHS PARTS AND LABOUR WARRANTY(EXTRA) ++ FULLY HPI CLEAR ++ LOW PRICE GUARANTEE ++EXCELLENT BODYWORK ++INTERIOR - EXCELLENT CONDITION++ TYRE CONDITION EXCELLENT++ FREE 12 MONTHS NATIONWIDE BREAKDOWN COVER ++ (CUSTOMER HAVE TO REGISTER WITH AA ) All the cars comes with standard 30 days warranty, its a option to buy extended warranty from us 3, 6, 12 or 24 months, Warranty are available by independent company and not including in a car price. All of our cars come with minimum 6 months MOTS, DELIVERY AVAILABLE NATIONWIDE AT COST, Full dealership history, Very clean bodywork, Black Cloth interior - Excellent Tyres, Excellent condition, BUY WITH CONFIDENCE WITH AFTER SALE SERVICE, WE PUT OUR CUSTOMERS 1STBUY WITH CONFIDENCE WITH AFTER SALE SERVICE, WE PUT OUR CUSTOMERS 1STP/X WELCOME,,ALL DEALER USUAL FACILITIES,++++++++++We Work Best on a Appointment Basis, Therfore Being Able to Give You Our Undivided Attention During Your Visit. So Please Call Today To Arrange A Viewing (APPOINTMENTS ONLY)CALL US ON LANDLINE *** MOBILE ***-833543, Upgrades - 12V Power Socket, Alarm Predisposition, Automatic Climate Control, Cruise Control, Door Mirror Covers Gloss Black, Front Fog Lights, Kickplate with Aluminium Insert & Punto Logo, Special Paint, 1 owner, Black Cloth interior, Standard Features - 15in Comfortline Alloy Wheels, ABS with BAS (Brake Assistance), Air Conditioning, Centre Rear Seat Belt, Deadlocks, Driver Knee Airbag, Drivers Airbag, Dualdrive Power Steering, Electric Front Windows, Front/Rear Headrests, Immobiliser, Passenger Airbag, Radio with CD and MP3 Player, Rear Windscreen Washer, Trip Computer, Upholstery - Cloth. 5 seats, BUY WITH CONFIDENCE WITH AFTER SALE SERVICE. WE PUT OUR CUSTOMERS 1ST. 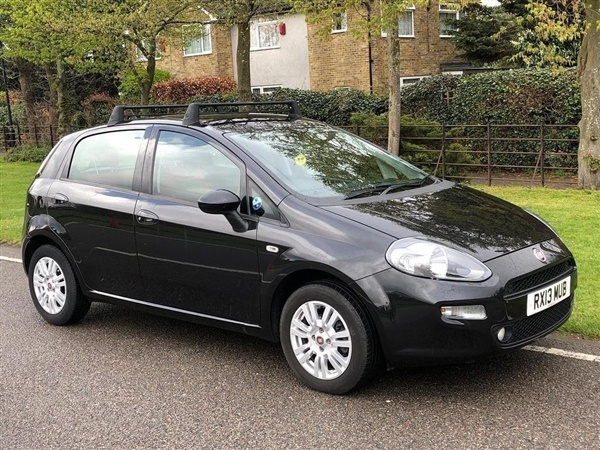 This advert is for a Fiat Punto, click Fiat Punto in Uxbridge to see more cars like this in the local area. Want to search further afield? Click Fiat Punto in Greater London to search for similar cars in the wider Greater London area.